The Canadian dollar strengthened against its U.S. counterpart on Monday, breaking through a key technical barrier during the session as domestic wholesale trade data beat expectations and oil prices jumped. Canada wholesale trade rose more than expected in May, driven by increased sales of motor vehicles and agricultural supplies, data from Statistics Canada showed. “Put simply, the Canadian data has been on fire,” Bipan Rai, executive director of macro strategy at CIBC's Capital Markets, told BNN in an interview Monday, noting inflation data as the exception. At 4:00 p.m. ET, the Canadian dollar was trading at $1.2503 to the greenback, or 79.98 cents US, up 0.3 per cent. 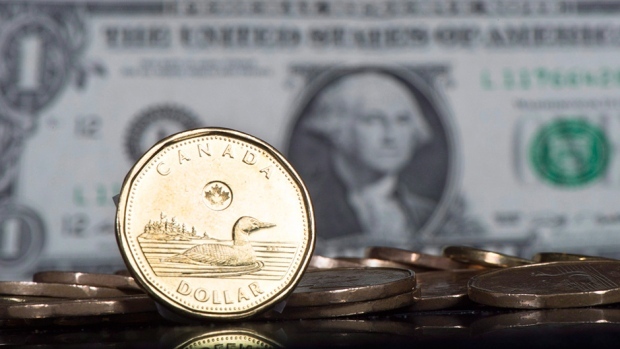 The loonie has been trading at its strongest in 14 months, helped by a hawkish turn from the Bank of Canada and an interest rate hike earlier this month. Markets also see a nearly 80-per-cent chance of another rate hike in October, which is continuing to provide strength for the Canadian dollar. The currency has gained some 10 per cent since early May, while the spread between yields of Canadian and U.S. two-year bonds has narrowed sharply since June and now sits at 8.7 basis points, its narrowest in more than a year. "[In] markets in general, the trend is your friend and momentum is definitely in favour of a stronger Canadian dollar," said Scott Smith, chief market strategist at Viewpoint Investment Partners. The combination of higher oil prices, solid economic data and a struggling U.S. dollar helped the loonie pierce $1.25, or 80 cents US, before backing off its session high of $1.2484. If the Canadian dollar holds around the 80 cent US mark, that could establish a barrier for further loonie gains, though there is still the potential for the currency to move as high as around $1.22, said Smith. The next immediate level analysts are watching is the 2016 high of $1.2461. Prices for oil, a major Canadian export, rallied after leading OPEC producer Saudi Arabia pledged to cut its exports to help speed up the rebalancing of global supply and demand. Canadian government bond prices were lower across the maturity curve, with the two-year price down 5.5 cents US to yield 1.278 per cent and the benchmark 10-year falling 34 cents US to yield 1.925 per cent.